2 1/4" Aramith Deluxe Quality Cast Phenolic Cue Ball with Red Spot. This ball has a small red dot on its surface. 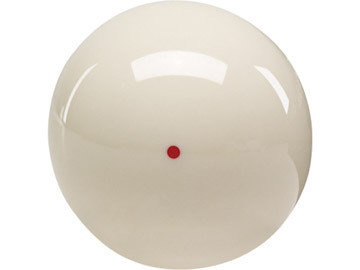 One advantage of the red dot cue ball is that it makes a great practice ball. You can use the dot as a target, and then compare your chalk mark with the position of the dot to see if you indeed stroke properly and hit the cue ball where you intended. The ball is regulation 2-1/4" in diameter and is regulation weight. It is made in Belgium by Aramith.